On the surface, you wouldn’t think anything of Sakura Kinomoto other than that she was a cheerful, energetic young girl, excited to be moving up into middle school. Underneath however, Sakura is one of the most powerful magicians of the age and as a descendant of the great Clow Reed, she has become the sole master of the magical Clow Cards, with them now all converted to use her own power as the Sakura Cards. After a strange prophetic dream, Sakura wakes up to find the Sakura Cards transparent and void of any magical power. 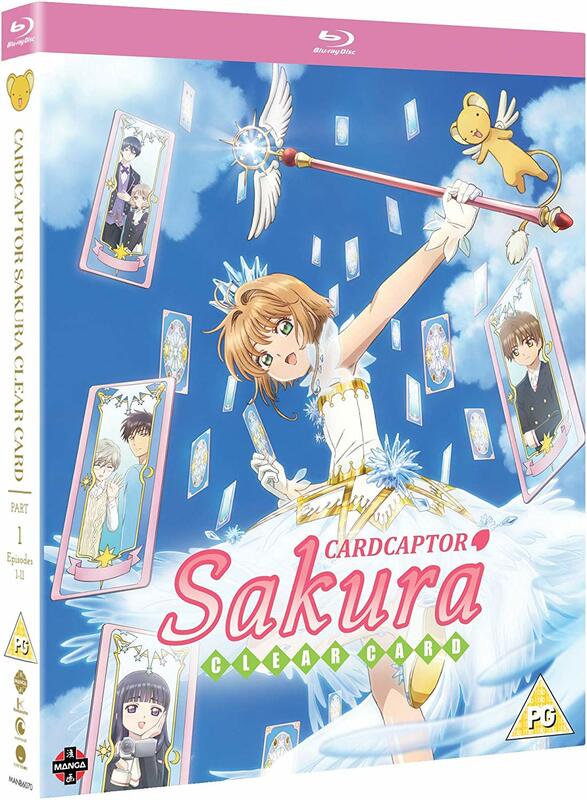 With the return of Syaoran Li from Hong Kong and the appearance of a new transfer student, Akiho, and her mysterious butler/guardian Kaito, Sakura becomes involved in a series of mysterious events as she takes up the role of Cardcaptor once more. As a sequel to one of the most loved magical girl series of the 90s (based on the popular manga by CLAMP) Clear Card certainly has a lot to live up to. The original is one of my favourite anime and (despite at first watching the messed-around Nelvana dub) formed a core part of my childhood. 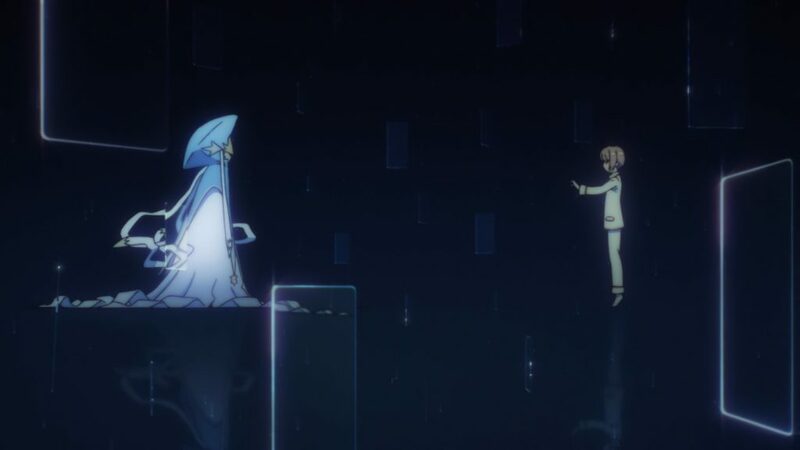 Clear Card therefore had me both excited and cautious, as I didn’t know whether it would meet my expectations; and while there are some aspects of it that I found slightly disappointing, this first half of the series is both a solid starting point and a concise cut of what made the original so enjoyable. Jumping straight into the first episode, it really feels like someone has hit a big red reset button, as although we have our bunch of familiar characters, this is a brand-new story that sets Sakura gathering magical cards again from scratch, all the while a mysterious new villain is hinted at in the background. While existing fans are going to know a lot more about the series than newcomers, I’d say this makes it a comfortable jumping-in point – sure, there are going to be details missed, but for the most part you don’t really need to know much to get along and enjoy this as a stand-alone work. While the series in general has always employed a mixture of action and mystery, it definitely feels like there is a stronger emphasis on the mystery side of things this time around, as it continually piles questions onto you and sets up an atmosphere of suspicion as several major characters seem to have things going on in their lives that will be pivotal to the story later on. While we did see this in the classic series, it just feels like they’ve taken it up a notch and woven in more plot threads, perhaps understanding that a lot of viewers will be those who grew up with the show and are now maybe in their late twenties and early thirties. This doesn’t mean that the atmosphere has changed, as it’s still very much the same show that we know and love, taking that familiar “card of the week” structure and setting out the goofy humour to a point where it feels like more of the same. The battles for the cards themselves can be a bit hit or miss, as while the first few and last few are highly entertaining, there are a few captures in the middle that simply go through the motions and take no effort at all to acquire. 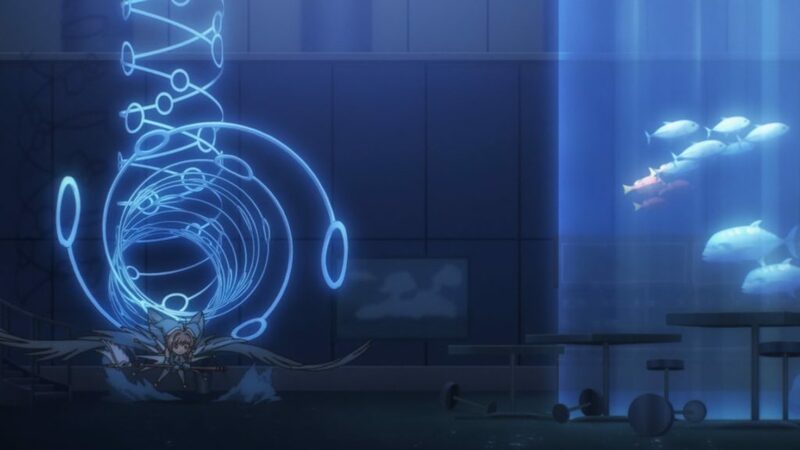 I find Cardcaptor Sakura to be at its best when it’s actually challenging Sakura with either a particularly difficult puzzle or giving her something to fight against; so in situations where she just has to walk up to a card to capture it, it kind-of feels a bit pointless. There are some nice episodes with great captures in here though, with the series hitting its stride from Episode 7 onwards. Away from the main plot, the series continues with taking a slice-of-life approach, with Sakura going to school, meeting friends and mixing the supernatural with the day-to-day. 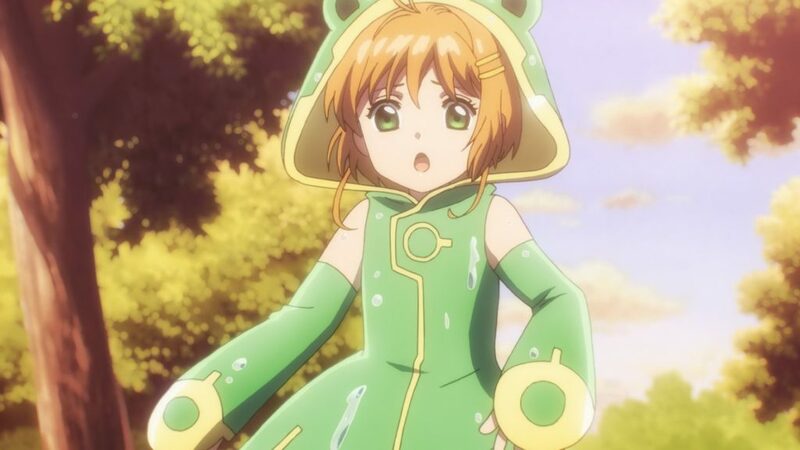 While this ended up being used as filler in the original series, there’s at least some attempt to make it meaningful and affect character development, particularly in showing Syaoran as being quite detached from Sakura’s main group of friends as he’s always busy with something bigger he’s got going on, and allowing the show to really focus on Akiho as a brand-new character. Akiho herself brings a lot to the table as a new addition; quickly forming a close friendship with Sakura as well as being involved in the main plot. While Sakura and Tomoyo are supposed to be best friends, they’ve never really done a lot of hanging out and goofing off together; the show often obsesses over Tomoyo’s film-making and costume-designing hobbies instead. Looking at Akiho, she really works as someone that Sakura can just go hang out with, filling a hole in Sakura’s relationships that I never realised she had. Akiho also brings in her butler, Kaito who, amongst other things, is a really great cook, enabling the show to double down on its love of food. And I mean, seriously, this show loves its food; at points you’d mistake this for a gourmet show with how much effort goes into the cooking segments – not that anything lasts long with Kero around, as much of the humour is derived from the guardian beast of the cards gorging on anything in sight. It’s one of the show’s main brands of goofy humour, and all of it so far has been really strong, from Kero being bad at video games, to Takashi’s elaborate tall tales and Sakura’s older brother Toya winding her up all the time. These may not be new to returning viewers, but it’s good that they’ve been kept in as it keeps the show as a fun and light experience. Some aspects have changed too much or not enough however – one thing that returning viewers will notice is the massive jump in technological advancement between the classic series and this one; jamming twenty years’ worth of development into a year or two in the show, going from large “dumb” mobile phones to smartphones and drones. On the grand scale of things, it doesn’t matter so much, but in terms of continuity I would have preferred it if they hadn’t modernised it as much. On the other hand, you’ve still got a creepy tone around relationships between older and younger characters – while these could have been passed off in the 90s, that’s definitely not the case today. One relationship in particular harking back to the original series actually just looks really stupid now, even if he is the reincarnation of the world’s most powerful magician. One thing that real world technological advancement has given this title is a huge boost in its visuals, and I must say that it is a pretty show. Some may look back at the hand-drawn charm of the original and prefer that, but for this season’s themes the addition of CG and modern animation techniques really add a whole new dimension. There’s a lot of effects that make things look like glass or crystal and being able to model these in 3D gives them both a more realistic look and a more magical feel. 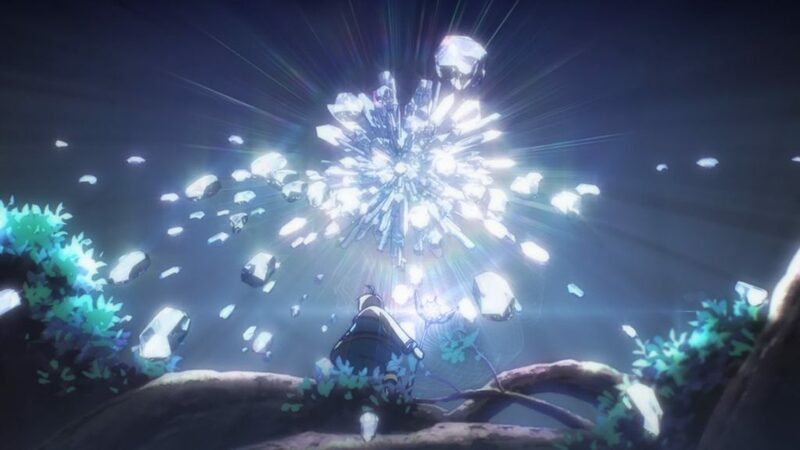 For example, there’s a scene where there are shards of glass flying around in one of Sakura’s dreams, and each shard feels like it has a real weight to it and that it could actually cause some damage as it flies past. The CG also works with the card designs being more abstract now, frequently taking after objects rather than looking like mythical beings. Design-wise there’s definitely more variety, and they feel like magical forces derived from Sakura’s power rather than creatures captured that help her out as the Clow Cards did. While there are some iconic Clow Card designs, a lot that were introduced in the anime looked basically the same, so I’d say this is a good change. And I can’t really mention design without mentioning Sakura’s new battle costumes. The frog one from Episode 3 is one of my particular favourites, but you’ve got a good few here overall – the one from Episode 9 will seem familiar to fans in particular. Also familiar is the audio, with the series using both the original Japanese voice actors and re-using many parts of the original soundtrack. Even in terms of Japanese voice acting, this series has always been very stylised so when it comes to the English dub; it becomes extremely difficult to produce something that sounds natural. Instead, they’ve tried to get as close to the Japanese as possible, and while it’s not the best I’ve ever heard, it’s largely okay. The one I do have an issue with is Jason Liebrecht’s Syaoran, as in English he sounds like a right wimp and his tone of voice lacks the stoic confidence that his Japanese counterpart has. I’m definitely not used to Mikaela Krantz’s Kero either, although that’s more about having the original English Kero in my head (whose voice actor I couldn’t find) which sounds distinctly more male. This is a Funimation release distributed by Manga Entertainment and contains the first eleven episodes. The subtitles therefore use Funimation’s default white, rounded style and are easy to read. In terms of extras you have the standard clean opening and closing titles and the prologue OVA episode, which acts as a bridge between the classic series and Clear Card, telling the story of how Sakura and Syaoran ended up with their bears. You don’t need to watch this before jumping into the series proper, but fans of the classic series will really appreciate the extra details. There are a couple of inconsistencies with the opening episode, suggesting they were produced at different times, but glossing over that, it’s a really good way of warming yourself up for the main event. While I was a bit mixed on the series while it was streaming, re-watching the first half for this review has left me feeling a lot more positive about it. 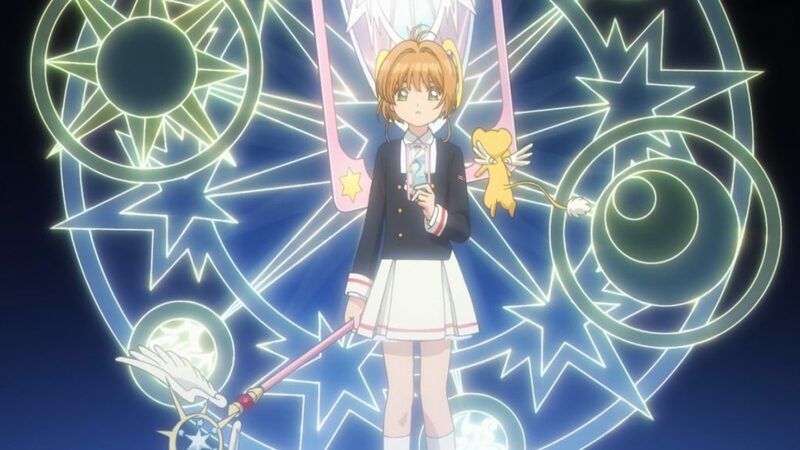 Apart from a few weaker episodes in the middle part of this release, this is the same Cardcaptor Sakura as it ever was, with a strong sense of fun, magic and mystery. While you’ll have to wait for Part 2 to get deeper into the plot threads that this first half sets up, this is definitely a good way to start the series. One of the biggest titles for the upcoming Winter 2018 season is heading to both services for simulcast.